We've Partnered with MedBridge. Get Your Unlimited Discounted CEU's Here! If you're like me, we have the disease of being busy. I have caseloads, business opportunities, blogs, family, taxes, billing, and as my head starts to spin, I could go on for days. In the past, I have waited for specific CEU's to roll around that I knew would be applicable to my patient demographic. Sometimes this would put me in a tough situation where I would have to spend money on airfare and hotels just to get certified in something that was voice or swallow related. MedBridge and I have partnered to offer quality CEU's at a very discounted rate so you can afford to educate yourself in the areas of knowledge specific to what you treat. 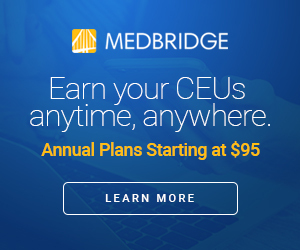 MedBridge has observed that dealing with overpriced CEUs is a constant issue with SLPs (among other disciplines) and they have created a website that offers online continuing education and patient engagement tools. These video courses are accredited and contain excellent research based approaches. MedBridge has hundreds of CEU courses, live webinars and is an ASHA Approved CE provider. 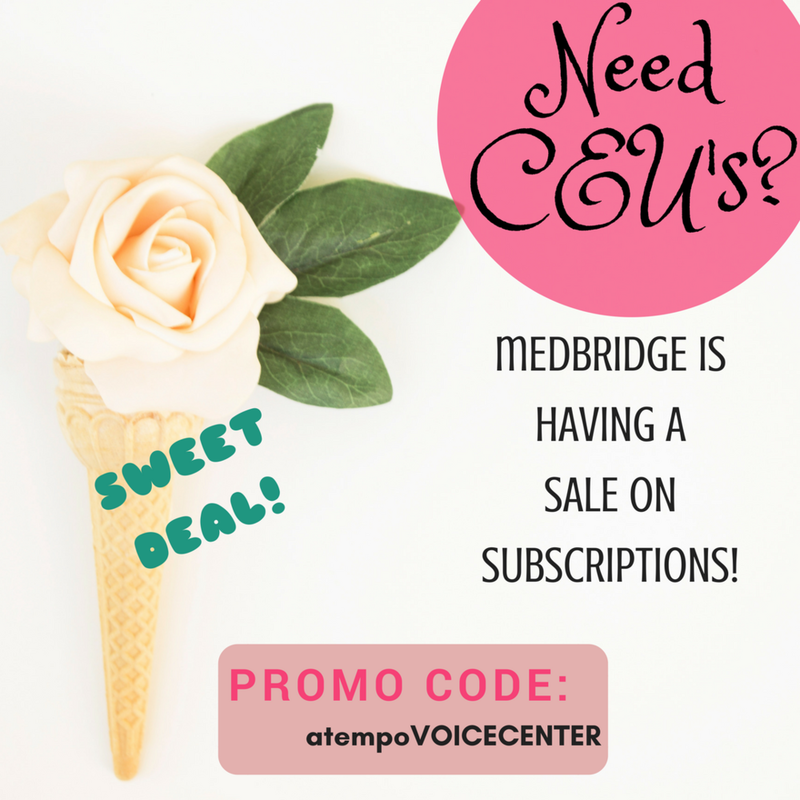 Use Promo Code: atempoVOICECENTER or click here to get your own discounted annual subscription to MedBridge for only $95! That's saving you $175 right away. You also get exclusive access to the home exercise program builder (HEP) which allows you to customize exercise programs specifically for your patients with over 5,000 video exercises. HEP's can be easily printed, texted or shared online. This means your patient is more likely to adhere to your home program, know what is expected and make progress. That's really what it's all about. Students? It's even better for you! 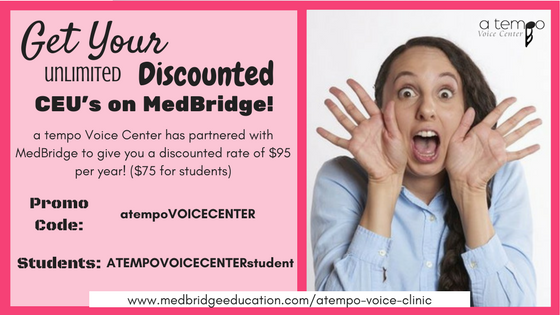 If you use the student promo code: ATEMPOVOICECENTERstudent you will have a yearly subscription at only $75! Remember, you must sign up with your email address ending in ".edu" for this to be honored. You still get everything in the yearly regular SLP membership, except for CEU credit, because you aren't eligible to earn until you have your license. The best part is that huge names in the voice community have recorded webinars that are available to you 24/7! This means voice gurus like Joseph Stemple, Edie Hapner, Mary Sandage, Robert Grider, Sarah Schneider, and even Julie Barkmeier-Kraemer sharing valuable and applicable knowledge. If you are a Many Hats SLP, you can expand your knowledge in many other areas. Plus MedBridge is adding more every day. I hope you'll take advantage of this fantastic offer, because you shouldn't feel like you are just getting CEU's to fill your quota. You should have affordable options to learn about areas specific to you. This benefits you as a clinician and most of all, your patients. Posted on September 21, 2017 by a tempo Voice Center.